Pumps are somewhat of an unsung hero in many industrial applications. Their purpose is to move fluids to and fro via mechanical action. These fluids may be liquids, gasses or even slurries, which are considered combinations between the two. This piece will briefly review the functions of pumps, the general classes of pumps and also provide input on how to select the right pump for your application, whatever it is that it may be. We already told you how important pumps are in any industrial application, even though it may be a part that you totally take for granted. And industrial pumps are actually usually divvied up into three main categories – direct lift, displacement and gravity. Pumps may be further classified based on their methods of placement. For instance, some popular types of pump types are positive displacement, or PD, impulse, velocity, steam and valve. Pumps work thanks to some type of mechanism, whether that mechanism is reciprocating or rotary. Some pumps run on electricity, while others may be powered by engines or by the wind. Some pumps are even operated manually. Depending on your application, you may require either a large pump or a small pump. Some pumps are huge, perhaps the size of a room, while others – mainly those used in the medical field – may be microscopic. Needless to say, but there are lots of different types of pumps available, but knowing which one is the right fit for your application could be the difference between success or failure. So just how do you know what’s the right pump for your application? It starts with knowing a bit about the pumps you’re considering so that you can make the best choice. What Pump is Right for Me? Centrifugal pumps: This is a popular type of pump that is often administered when dealing with low viscosity liquids and high flow rates. A centrifugal pump is characterized by impellers that rotate with the shaft, creating energy to move – and pressurize – the thin liquids as it moves along. Centrifugal pumps are commonly used in water, sewage and oil applications. Gear pumps: This is another very popular style of pump, characterized by liquid being pumped as it’s passed between two gears. Gear pumps are available in either internal or external varieties. They’re very strong and can be built to fit within tight tolerances. They’re often utilized in the likes of hydraulic equipment, in automotive applications, machine tools and in semi-trucks. Hydraulic pumps: There are a variety of hydraulic pumps, such as hydraulic piston pumps, hydraulic gear pumps, hydraulic screw pumps and hydraulic vane pumps. These pumps work, simply put, by pressurizing hydraulic fluid. Hydraulic pumps are mostly outfitted on hydraulic machines and other applications. These pumps are designed to be tough and long-lasting, so they perform well in demanding environments. Screw pumps: Screw pumps work similar to gear pumps in that they rely on the use of two or more screws to move fluid through a system. 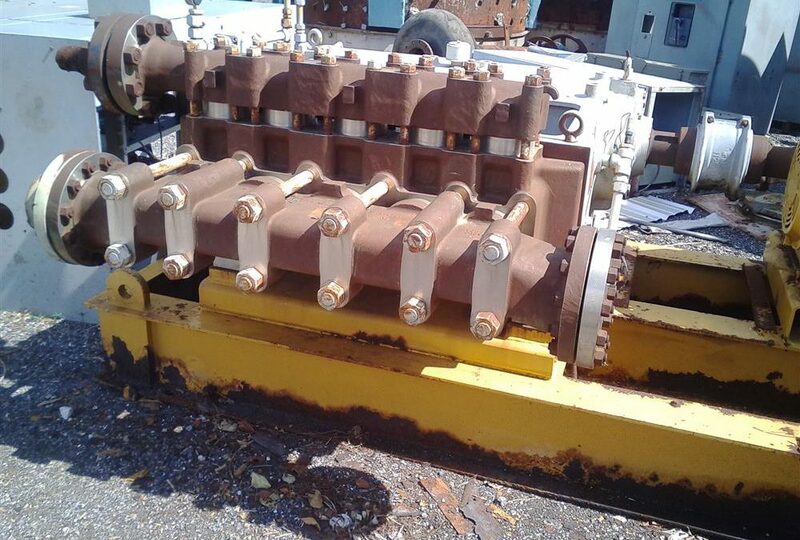 Screw pumps are commonly utilized in oil and gas applications. Submersible pumps: Many pumps are actually designed to work under water. These pumps are known as “submersible pumps,” and they work primarily in water applications, installed beneath the surface of the water. Sump pumps are a common example of submersible pumps, though sump pumps may also be pedestal pumps. Vacuum pumps: These pumps are designed to pull a medium out of an area for the purpose of creating a partial vacuum. The mediums that vacuum pumps work with may be either liquid, gas or air. Plastic pumps: While many of the pumps that we’ve listed here are designed for removing basic liquids and gasses, plastic pumps are specifically designed to transport much more hazardous liquids. Because plastic stands up better when exposed to volatile liquids in many cases, the material is especially useful when dealing with these hazardous mediums. We’ve listed 7 common pumps here, but that’s only a drop in the bucket when it comes to the total number of pumps that there are available. And while the aforementioned are some of the most common types used in industrial applications, there are a bevy of factors that you need to be considering before deciding whether or not a pump is right for your application. Factors such as the type of liquid or gas that is being dealt with, whether the pump will need to be submersed, what the viscosity of the liquid is, how difficult the pump is to reach on a particular application and what type of an environment the pump will be working in. As we mentioned earlier in this piece, pumps vary in all kinds of shapes and sizes. Some are large enough to take up an entire room, while others are small enough where they cannot be observed by the naked eye. Based on this, it likely doesn’t surprise you to learn that the prices of these pumps also greatly vary. While some might only cost a few hundred dollars, others may cost several thousand dollars. But being that pumps are critical components to industrial equipment, the lack of an efficiently operating pump can cause downtime and lost profits. So, simply put, a pump is a component that a successful business cannot do without. But what happens if a pump failed prematurely and you don’t have the money budgeted to acquire a replacement just yet? After all, a pump is something you need – it’s a necessity, not a luxury. If that’s the case, one option is to purchase a previously used pump from a credible source such as Bid on Equipment. By purchasing a used pump from Bid on Equipment, it’s like getting a new pump at a used price. For more information on pumps, and to browse the selection available at Bid on Equipment, contact the company today.